While Logitech has long been known for its video conference cameras, the company wants to make a name for itself elsewhere in the meeting room, too. Toward that end, today it introduced a touch-control display called Logitech Tap. Tap, shown above, features a 10.1-inch touchscreen, an HDMI port for local content sharing, physically secured cabling, and multiple mounting options for a variety of meeting room layouts. Logitech offers Tap as a component of its pre-configured Logitech Room Solutions, which include a small computer, a Logitech conference camera, and room-optimized video conferencing software from Google, Microsoft, or Zoom. Because it’s built on open standards, Tap can also integrate with digital whiteboards and other room systems. With Tap, Logitech aims to solve the hassles associated with starting and controlling meetings in a way that improves on the capabilities available from room control form factors such as the remote control, AV controller, and tablet, said Joan Vandermate, head of marketing at Logitech’s Collaboration business unit, in a No Jitter briefing. In particular, Vandermate pointed out common problems associated with using tablets, increasingly popular devices for room control. Tablets can be easy targets for thieves, she said, and because they’re typically consumer devices, there’s no good way to ensure they stay charged and plugged in. Plus, because these devices run on Wi-Fi, there’s no way to give them an Ethernet connection. And, she added, you can run into issues with these devices deciding to update their operating systems at inopportune times, like when you’re trying to start a meeting. 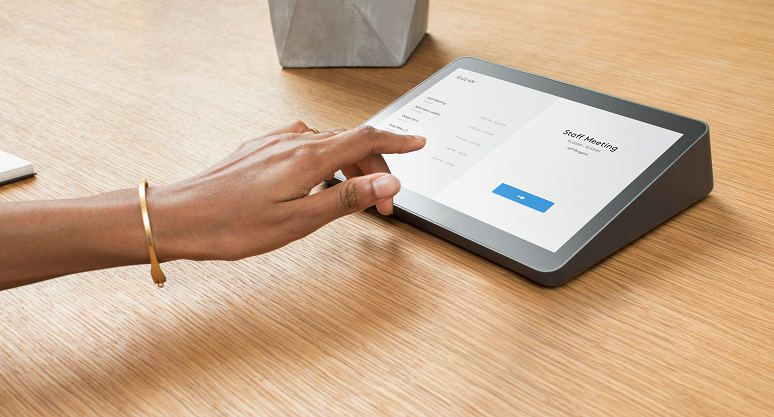 As it looked to improve on the tablet’s shortcomings, Logitech applied lessons learned from its first-generation Skype Room Systems and SmartDocks, Vandermate said. For example, customers found its first-generation Skype Room System too bulky, large, and proprietary, Vandermate said; it featured a Microsoft Surface tablet and customers told Logitech they wanted the ability to select their own compute platform. Tap has a streamlined profile so as not to block lines of sight and clutter the conference room table with compute- and related-cables. Tap can simply sit on the table, with the power cord and USB cable to the meeting room computer channeled out the well in the back of the device. Or enterprises can go with more permanent options like a riser, table, or wall mounts, available for an additional $199. In addition, Tap is compatible with any compute platform or operating system that supports USB input, Vandermate said. To make the solution a good fit for any kind or size of room, Logitech has made the 10-meter USB cable standard, and provides a 25-meter option for the additional price of $499. In a lesson learned from its SmartDock, which featured a proprietary cable that wasn’t rated for placement in conduit, Logitech outfitted Tap with cable reinforced and rated for running through conduit, air gaps, and walls. To start, Tap launch partners are Google, Microsoft, and Zoom, and Logitech has created a range of bundled solutions for each, primarily available from resellers and AV integrators, Vandermate said. However, Tap also is available as a standalone product for $999. When purchased as a bundled solution, Tap will come in a co-branded box and the compute platform will be preloaded with Zoom, Microsoft, or Google software. Microsoft and Zoom packages use an Intel NUC, while Google packages use a Chromebox. Logitech is in discussions with more than 20 additional partners, such as BlueJeans, Fuze, and Vidyo, about doing bundles or certifying Tap for use with their software solutions, Vandermate said. Logitech’s latest announcement highlights a growing trend that has facilities, AV, and communications and collaboration systems coming together -- both in the enterprise, in practice, and in terms of the solutions that are coming to market from providers and their partners. Logitech Tap will be available for purchase in spring 2019. The company will be showcasing the solution this week at ISE as well as in at Enterprise Connect, at booth #1019. If you haven’t yet registered for Enterprise Connect, coming to Orlando, Fla. March 18 to 21, do so now to take advantage of our Early Bird Rate. Use the code NJPOSTS at checkout to save an extra $200 off.